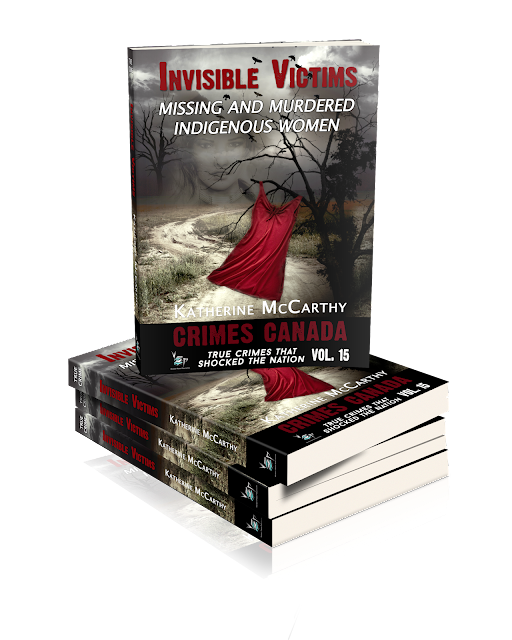 I'm so excited to share with you the cover for my debut book Invisible Victims: Missing and Murdered Indigenous Women. It's taken me the best part of a year to prepare, research and write this account. Seems like a very long time, however, in order to really understand the issues impacting Canada's MMIW crisis and to do its telling justice, I felt it was time well spent. Indigenous women and girls are more likely to suffer extreme violence than other women. They are more likely to disappear and never be seen again. And sadly, they are more likely to be murdered by a serial killer. For decades, it has been Canada's dirty little secret. Then in 2014, the horrific murders of Loretta Saunders and Tina Fontaine made headlines across Canada, ignited widespread outrage and exposed Canada's national shame. So why is the level of violence towards Indigenous women reaching crisis levels? Centuries of discrimination, long term effects of the dreadful residential school era, and many other appalling government-approved practices have resulted in widespread racism towards Indigenous people. Attempts at genocide didn't cease centuries ago like many believe. They just became more subtle. Invisible Victims is a shocking work that shines a spotlight on the Missing and Murdered Indigenous Women tragedy in Canada, its root causes and several cases. It also includes serial killers who specifically targeted Indigenous women as victims, as a direct result of indifference on the part of Canada's law enforcement, media and government.